Recently AEON Group launched AEON Member Plus Visa Card & AEON Wallet mobile app to steer Malaysians towards becoming a Cashless Society. As AEON regular patrons, I am so glad that now I can pay for all my shopping using mobile app seamlessly, conveniently and its secure too. Have you ever experienced this embarrassing situation where you found out that you forgot to bring your wallet when you are at the cashier counter. That happened to me several times, I forgot to bring my wallet out but not my handphone. Geee… it was so embarrassing especially there are so many people queuing behind. So now with AEON Wallet mobile app such embarrassing situation won’t happen anymore. Nowadays me and my friends also prefer to use cashless payment, and AEON Wallet mobile app is very handy, all i need is my smartphone. Not only it’s so convenient to use but also comes with so many benefits. Not to forget, your AEON Member Plus Visa Card is always in AEON Wallet. So you will always get to collect AEON Points no matter the situation. Cashier will just need to scan your “Show Member Card” in AEON Wallet. 1. I can also top up AEON Member Plus Visa Card anytime, anywhere with no additional charges and its instant. 3. When I want to redeem my points, I can check AEON Points and redeem AEON Points on AEON Wallet with any hassle. Everything is just a few click away on my finger tips. 4. One of the benefits about AEON Wallet that I find it useful for us to track our expenses because with this app I can check my transaction history, see where and how much I spent. With that I can plan my budget and spend more wisely too. Going Cashless with AEON Member Plus Visa Card & AEON Wallet Launch at AEON Mall Shah Alam, Selangor. 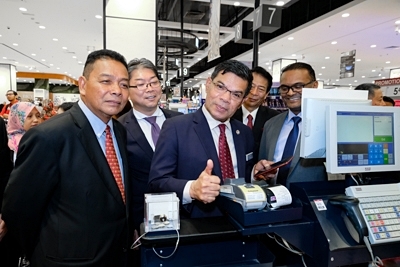 The official launch of both products was attended by Yang Berhormat Datuk Seri Saifuddin Nasution Bin Ismail, Minister of Domestic Trade and Consumer Affairs; Shinobu Washizawa, Managing Director of AEON ASIA SDN BHD and AEON CO. (M) BHD; Kenji Fujita, Managing Director of AEON Credit (M) Berhad; Masayoshi Masuda, Managing Director of AEON BIG (M) SDN. BHD. ; and Ng Kong Boon, Country Manager for Visa Malaysia. Well the AEON Member Plus Visa Card is a 1-for-all card that not only allows AEON loyalty member card customers collect double the points at all AEON Retails, but also functions as a Visa prepaid card for cashless payment in-store and online. With integrated Visa functionality, the AEON Member Plus Visa Card is a card that we can use to make purchases without having to worry about security. It also supports Visa payWave for faster transactions. 1. Earn 2X AEON Points: Earn 2X AEON Points for every RM1 payment in any AEON Stores, AEON BiG Hypermarkets, AEON MaxValu, AEON MaxValu Prime and AEON Wellness using AEON Member Plus Visa Card. 2. Higher Rewards: AEON Points earned can be converted into e-money in your Card. 3. AEON Exclusive Benefits: exclusive Benefits in AEON Stores and AEON BiG Hypermarkets for special price item and Thank You Day Promotion. 4. Anyone can apply: it’s a prepaid card so there is no income documents required. You only need your identity card to register. 6. Tap to pay with VISA payWave: Tap your VISA card in front of a secure reader for payment at the participating merchants. No PIN is required for purchases below RM250 in a single transaction. 7. Budget Control: This AEON Member Plus Visa Card enables you to allocate your money in the prepaid card as a budget for your daily usage. Supplementing the functionality of the AEON Member Plus Visa Card is the AEON Wallet – the first mobile application system that is launched by a retailer in Malaysia. This app is linked to your AEON Member Plus Visa Card and allows for payment via QR code at all AEON Retails. Oh yay! I have signed up for my AEON Member Plus Visa Card and also now I am an AEON Wallet user. As you know, cashless transactions are becoming increasingly common and I personally find it more convenient to pay with my mobile app. AEON Wallet is now available on Apple App Store and Android Play Store for free download. The AEON Member Plus Visa Card and AEON Wallet are now available to all Malaysians. Card owners can top-up funds at any AEON Retails cashier counters, AEON Credit Service’s ATMs, via internet banking, or instantly top up on AEON Wallet mobile app with no additional charges. Top Up RM50-RM99.99 = Get 50 AEON Points. Top Up RM100 and above = Get 200 AEON Points. So hurry head over to AEON and get your AEON Member Plus Visa Card to enjoy more benefits and download AEON Wallet for more convenience. Yes! let's head towards a Cashless Society. 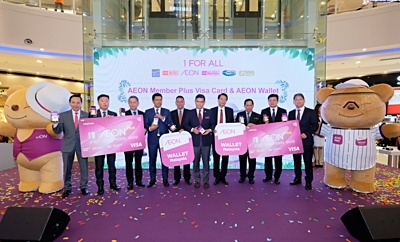 Well, overall I find that this newly launched AEON Member Plus Visa Card and AEON Wallet are the synergy towards a cashless nation. Now making payment for our purchases is becoming more convenient, fast and at the same time is secure too. I personally has started using mobile app to pay and I find its benefiting me in many ways. Plus we get more points when we make payments using AEON Wallet, so why not.